"Every mile driven in style before arriving with a smile"
When it comes to chauffeur services, we like to think Royal Silver Service is ahead of the competition. We offer a service that is tailored to your individual needs and we are more than happy to work with you on larger events, group tours or smaller more personalised occasions. From the moment your Royal Silver Service chauffeur arrives, you’ll feel in safe hands. Did you know that you can hire the vehicles like the Maybach 62 driverless and have you own Chauffeur drive you. Many V.I.P.s prefer to have their personal chauffeur drive them. In cases like this we may be able to supply you with a driverless vehicle. Whether you are doing business or shooting a movie we can help by supplying vehicles without drivers. Hourly rates (min 4 hours) includes 40 miles. Evening and Wedding rates (min 6 hours) includes 60 miles. Full day includes 8 hours and 100 miles. Note: These example London area Airport Transfer and Dock Transfer prices are based on journey times/distances to/from Piccadilly Circus, London, W1. All prices exclusive of UK VAT charged at 20%. Transfer prices are based on journey times/distances to/from Piccadilly Circus, London, W1. Other transfers are by quotation using our on-line form. Meet/Greet at Docks & Airports is £25 and covers 30 minutes of waiting time. Surcharges apply to work done between midnight - 6am and Bank Holidays. High Season prices apply from 14th May to 15th September and 15th December to 3rd January. Our VIP Fleet - Maybach 62, Rolls Royce and Bentley - is garaged in Central London. These are charged out base to base at our hourly rates, plus any excess mileage costs for travelling outside the M25 area. This pricing framework will give you a general idea of the cost of travel. Please use our on-line form or contact us by phone or email, for a quote for your specific journey. Pre-book with us and you will be truly satisfied with the chauffeur service you receive. You will find us to be totally reliable and very cost-effective. Royal Silver Service runs a substantial fleet of quality chauffeur driven cars and limousines - focusing on Mercedes S-Class saloon in all variants, Maybach 62 available for chauffeured or Self Drive hire in the UK, Rolls Royce Phantom, Rolls Royce Ghost, Mercedes Pullman Limousine. For transportation of larger groups, our fleet also includes Mercedes V-Class, executive minibuses and executive coaches from 12 to 52 seat capacity plus. 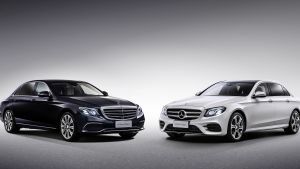 We focus on providing late model, high value, chauffeur driven cars for private individuals and company senior executives, their important business contacts and potential clients. This includes airport transfers to/from hotels, ports, stations and private airports. We also provide cars and limousines for social occasions including Ascot, Wimbledon, Glyndebourne, Henley, Hickstead, the Grand National, cultural and sporting events, festivals, concerts, external business meetings and wedding car hire across the UK. We operate an efficient "top end" chauffeur services business licensed by the Public Carriage Office (PCO) as are London's world famous black taxis, in London and across the UK. Our experienced British, PCO licensed chauffeurs work for senior executives in a wide variety of blue chip, multi-national businesses, UK and overseas government departments, as well as overseas royalty, dignitaries and diplomats. All work is pre-booked to ensure a completely reliable service for all our clients - who include Microsoft, the BBC, JP Morgan, Barclays Bank, CIBC, Eurostar and Sony Music. We have a non-smoking policy for all vehicles and drivers. We do not attempt to work at the cheapest possible prices as we believe that all our clients deserve the most professional and reliable services available. You can contact us via the Online Quotation Form or by email, telephone and post. Royal Silver Service™ is a UK Chauffeur Hire and Travel Consultancy Company We are London based and UK wide! Looking for money saving deals? Check out our friends website Valid Vouchers UK. Website built by I do I.T. Ltd.